I've never even heard of Quinault River Blueback Salmon. But I'm a sucker for exclusive stuff, therefore this has picqued my interest. Today through mid-next week ONLY Deuxave will be serving "Quinault River Blueback Salmon" – only available at 8 restaurants nationwide. Chef Chris Coombs is thrilled at the arrival of his Quinault River Blueback Sockeye Salmon, which he considers to be the finest salmon in the world. The Quinault River Blueback Sockeye Salmon are only allowed to be fished one week a year with the maximum amount caught being just 500, this translates to only eight restaurants nation-wide serving the salmon for only one week. 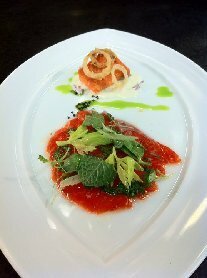 Deuxave showcases this rare salmon in a Duo of Salmon featuring spring herb and citrus salmon sashimi and kiss-seared salmon served with dried flowers, horseradish cream, mint oil and black lava salt. Sounds delicious. I want some. 7 Response to "Quinault River Blueback Salmon @ Deauxave"
Fishing 1 Week per year? I guess I better go tell the Quinault Tribe. They've been over fishing for 2 months then. I do agree, it is the Best Salmon on the Planet. with cedar planks! How do you spell YUM. I went to the Quinault fish facility on the Quinault River just last week and had some fresh blueback roe, smoked roe and smoked blueback. Rich taste and the best salmon ever! Better than Copper River salmon flown in from Alaska. Yes we have the best blueback ever!! If it don't say Quinault on it DON'T eat it!!!! Who told you one week a year, I guess they can triple the price on making it sound so exclusive, which it is. But it's fished like a whole season, and pretty sure a lot more than 500 haha. Economics lesson to be learned, make it sound exclusive, rich people want it even more, willing to throw a LOT more money on it.